CHIO Aachen 2015: Scott Brash and Tinne Vilhelmson! Aachen is host to the European Championships later this year and therefore the CHIO Aachen was held in a shortened format. 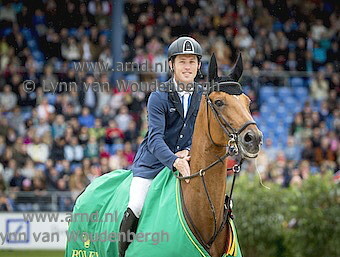 Scott Brash en Tinne Vilhelmson were victorious in the biggest classes. Scott won his second Rolex Grand Prix with Hello Sanctos scoring an enormous extra bonus, which explains his broad smile. Tinne Vilhelmson and Don Auriello were the surprise winners of the freestyle on Sunday. We now have images online of the winners, with more to come soon.